The popularity of crowdfunding has given birth to a new style of Scotch whisky distillery, one owned and operated by the local community. These socially inclusive enterprises give back to the local economy, but aren’t without their challenges. Gavin D. Smith reports. ‘Traditional’ shareholders are notoriously unsentimental people, often focused on short-term dividends rather than long-term strategies. Distillers have to bend to their will, sometimes regardless of whether this is necessarily in the long-term interests of the business or of the distilling communities. This is not to paint all distillers as corporate pantomime villains; many take social responsibilities very seriously, and contribute significantly to the local environment and population. One relatively recent example is the privately-owned Isle of Harris Distillers, which promotes itself as ‘the social distillery’, and has placed itself at the heart of island life in the Outer Hebrides. But is there an alternative that materially benefits the communities in which distilleries are situated? Apparently, there is. Leading the way is GlenWyvis, constructed on a hillside a couple of miles from the Highland town of Dingwall during 2017. The distillery takes its name from two long-lost local distilleries, Ben Wyvis and Glenskiach, and is the brainchild of local farmer, commercial helicopter pilot and green energy advocate John McKenzie. McKenzie was keen to create a business that would be environmentally friendly and also integral to the local community. Accordingly an initial round of crowdfunding was instigated, leading to the formation of GlenWyvis Distillery Ltd, an ‘Industrial and Provident Society (IPS),’ or co-operative venture. It has more than 3,000 members, and the distillery currently provides five full-time jobs. According to GlenWyvis’ director of brand and communications Neil Urquhart: ‘We raised just over £2.5 million in our first share offer, and are approaching £1.1m in the second. These monies have funded the construction of the distillery, all the equipment and the bonded warehouse. Meanwhile, a much-vaunted community distillery venture on the island of South Uist – first mooted in 2016 – has failed to materialise yet, allegedly due to disagreements between members of Storas Uibhist, one of the oldest and largest community landowners in Scotland. The distillery was to be located in Lochboisdale, close to where the SS Politician sank in 1941, giving great PR potential for Whisky Galore! novel and film associations. A multi-million pound support grant had been arranged with the Scottish Government, but ultimately no application for it was made. The distillery was to be housed in an innovative lighthouse-style building, and if the project does go ahead at some point, it will be on a privately-funded basis. So, is there a danger that community distilling ventures might fall foul of ‘too much democracy’, of too many people believing that they have a right to see their views implemented? Wasn’t it the great motor-racing autocrat Enzo Ferrari who once declared that the ideal committee consisted of just two members, one of whom was always absent? The positive example of GlenWyvis has inspired Edinburgh-based businessman Peter Brown to revive his long-held ambition to create a distillery on the Hebridean island of Barra, where Compton Mackenzie wrote Whisky Galore!. Brown explains: ‘We saw what GlenWyvis was doing and thought it was the perfect model for Barra. We acquired a site for the distillery and a dam years ago, and I’ve passed that on to Uisge Beatha Nan Eilean, which is closest to being a co-operative. The distillery will operate with one pair of stills producing around 25,000 litres of spirit per year, and the focus will be on single cask bottlings. As at GlenWyvis, wind, water and solar power sources will be utilised, and the team behind Barra boasts that it will be the ‘most environmentally friendly distillery’ in Scotland. Peter Brown cites the example of Bruichladdich as one reason why community-owned distilleries may seem preferable to those subject to the whims of shareholders. ‘The thing that has concerned me all along is that Bruichladdich was not ready to sell, or at least Mark Reynier [CEO] was not ready to sell. Mark’s baby was taken off him,’ declares Brown. After initially stating, ‘We don’t want the economic activity on Barra being taken off the island,’ Brown explains further. ‘There is too little attention paid to long-term investment. Everybody wants a quick buck. It goes beyond whisky into industry generally. This is a way of a community taking back control of aspects of their lives. 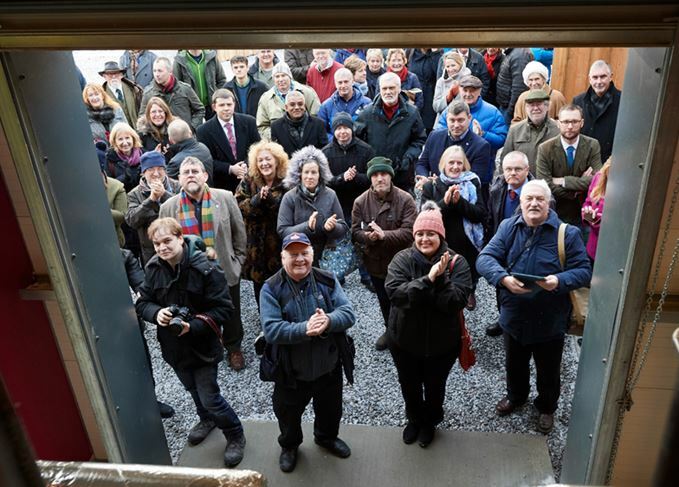 The new, community-owned, island Scotch whisky distillery needs to raise £2.5 million. The Isle of Harris distillery has finally opened following seven years of planning. The event will showcase four of the region’s distilleries and its ‘spectacular’ whisky trail. Scotland’s first crowdfunded distillery, 100% green energy-powered, is ready to open. New distilleries are expensive – and you can’t sell a bottle for years. How do you survive the wait?